Repeats every month on March, April, May, June, July, August, September, October, November, December on the third Saturday until Sat Mar 21 2020. Is your device running slowly or having trouble starting up? 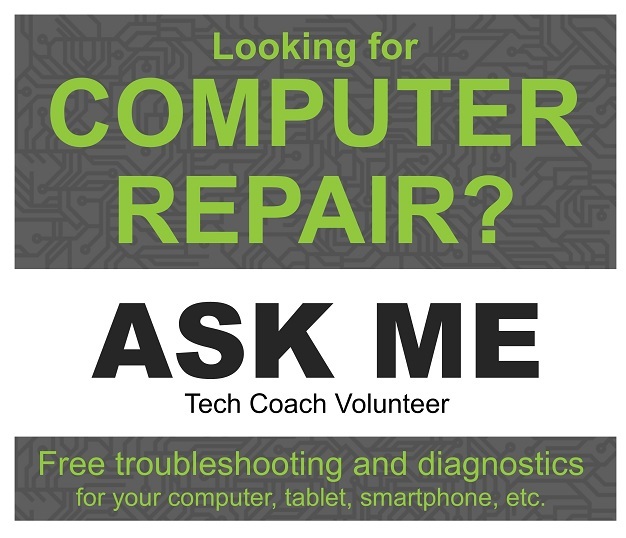 Bring it in and let us help you troubleshoot and diagnose the problem...for FREE! Tech Coach Volunteers will be on duty to help you install and run free antivirus/anti-malware software to get your device cleaned up and running again. We'll help you find your device's existing troubleshooting support and run diagnostics. We are able to resolve most issues in these sessions but if we cannot fix your device, we will provide trusted local low-cost options for a solution! If you need help with a desktop computer, please bring only the tower and power cord. No need to lug all the other stuff around since we will have monitors, keyboards and mice on-site. No appointment or registration necessary. However, if we are unable to help you within the scheduled session, we will absolutely schedule a later appointment to ensure you get the help you need.